Are you thinking about updating your image, but finding you’re unsure where to start? Rather than first focusing in on major items such as: shirts, sweaters or what style of jean to buy. My advice as a personal stylist for men would be to start with updating your accessories. Accessories are a versatile, affordable luxury that can completely change the look of an outfit. Whilst not having to have a major impact on your wallet. If you get your accessories right, it can completely transform your attire - upgrading ‘ok’ to seriously stylish. Scroll down to see which accessories you can easily update. Aviators and Wayfarers are by far the most popular style of sunglasses for men. Over the years they have remained classics that never go out of style. Though that is not to say sunglass brands rest on their laurels - styles are constantly updated and tweaked to suit a whole range of face shapes. These style of aviators soften and suit a square shaped face and look best against darker colouring. The wayfarers would look great on an oblong (longer) face, with the tortoiseshell frames complimenting lighter colouring. Whilst you may be tempted to go straight for new technology, I would suggest if only buying one watch opting for a more traditional style. The smart watch may be able to monitor the amount of steps you take, or call your mate up for a beer, but it doesn’t multi task in the style stakes. A key colour for 2019 is blue (mostly shades of navy) in watch faces and straps. Which is great news on the styling front, as blue is ‘the’ most versatile of colours. Due to its smart casual nature a blue watch not only goes with a smart suit, but also works with casual weekend gear. Perfect, for a busy schedule where you don’t have the time or inclination to swap over watches to match your attire. 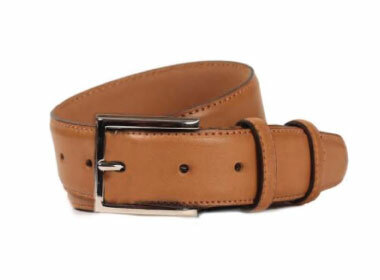 A good belt does more than simply hold your trousers up; it also pulls your overall look together. They are also one of those rare items in menswear that you don’t have to spend a fortune on to get a good quality. When choosing a belt go for a colour that compliments the majority of your casual shoes and then another more formal style to wear with dress shoes. Fabric belts always look better in warmer months, especially worn with leather sandals. Always opt for a smaller classic buckle in subdued metal tones. Large or ‘fun’ belt buckles that you can grab hold of, will never ever be considered stylish! They are a crime against fashion and you should never go there. Even if you are not naturally a hat wearer, almost every man can wear a cap. A baseball cap has the ability to add a casual edge to any outfit. The flat cap made even more popular by ‘Peaky Blinders’ can add sartorial style to even the most basic of looks. With so many styles and colour ways available, use a more neutral tone to compliment an outfit and make a statement with a brighter contrasting colour. Women have been doing this forever, which is changing their bags in accordance with each look/occasion. If you want to look en pointe then it’s time to own more than one bag. Leather bags are ideal for the daily office commute. 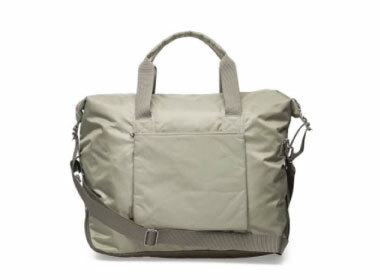 Consider buying a versatile cross-body bag or a satchel style which takes subtle detailing from women’s styles. Both of which are set to be popular this year. Look at man-made fibres for a more casual approach. For some extra style points, I would recommend going for an on trend colour like sage. I hope my article has given you some ideas on updating your style? If you would like to update your wardrobe further and require a men’s personal stylist, please don’t hesitate to contact me. I am based in London, but also offer online styling if you are unable to book a styling appointment with me. Thank you to Edward Pritchard Of Pritchards clothing store who contributed towards this article and could be of attire and styling help if you live in the Hereford region.